Create your very own ice dancer from an old fashioned clothespin. Attach a magnet to the bottom to make her spin and dance! Paint the bottom of a clear plastic plate with blue suncatcher paint. Cover the edges of the bottom of the plate in iridescent glitter. Flip the plate over and glue white jumbo fuzzy sticks around the edges to look like snow. Paint the top half of an old fashioned clothespin light blue. Wrap brown friendship thread around the top of the clothespin until it is covered, to create the ice skater’s hair. Cut a piece of brown friendship thread and fold as shown. Fold in half one more time. Cut off top half to be the ice skater’s bun. Glue the bun to the top of the clothespin and paint the rest of the top of the clothespin peach. Stick the ends of white feathers through the middle of the clothespin and around the front of the clothespin and glue to create a flowing skirt. Glue small silver acrylic jewels to the ice skater’s hair to create a tiara. Draw a face using markers. Glue a neo-magnet to the bottom of the clothespin. Glue a neo-magnet to one end of a dowel. 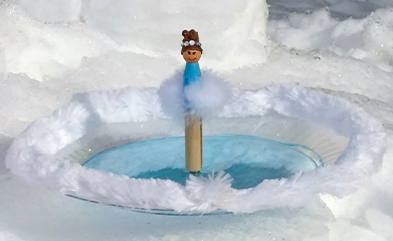 Use your magnetic dowel to make the ice skater spin and dance!